I know the delta changes, but why should I care about it? If the change in delta really matters, how do I estimate the likely change in delta? We will talk about the 2nd question first as I’m reasonably certain the answer to the first question will reveal itself as we progress through this chapter. As introduced in the previous chapter, ‘The Gamma’ (2nd order derivative of premium) also referred to as the curvature of the option gives the rate at which the option’s delta changes as the underlying changes. The gamma is usually expressed in deltas gained or lost per one point change in the underlying – with the delta increasing by the amount of the gamma when the underlying rises and falling by the amount of the gamma when the underlying falls. When Nifty moves from 8326 to 8396, the 8400 CE premium changed from Rs.26 to Rs.47, and along with this the Delta changed from 0.3 to 0.475. Notice with the change of 70 points, the option transitions from slightly OTM to ATM option. Which means the option’s delta has to change from 0.3 to somewhere close to 0.5. This is exactly what’s happening here. Notice how well the delta transitions and adheres to the delta value rules we discussed in the earlier chapters. Also, you may wonder why the Gamma value is kept constant in the above examples. Well, in reality the Gamma also changes with the change in the underlying. This change in Gamma due to changes in underlying is captured by 3rd derivative of underlying called “Speed” or “Gamma of Gamma” or “DgammaDspot”. For all practical purposes, it is not necessary to get into the discussion of Speed, unless you are mathematically inclined or you work for an Investment Bank where the trading book risk can run into several $ Millions. Unlike the delta, the Gamma is always a positive number for both Call and Put Option. Therefore when a trader is long options (both Calls and Puts) the trader is considered ‘Long Gamma’ and when he is short options (both calls and puts) he is considered ‘Short Gamma’. For example consider this – The Gamma of an ATM Put option is 0.004, if the underlying moves 10 points, what do you think the new delta is? Before you proceed I would suggest you spend few minutes to think about the solution for the above. Here is the solution – Since we are talking about an ATM Put option, the Delta must be around – 0.5. Remember Put options have a –ve Delta. Gamma as you notice is a positive number i.e +0.004. The underlying moves by 10 points without specifying the direction, so let us figure out what happens in both cases. 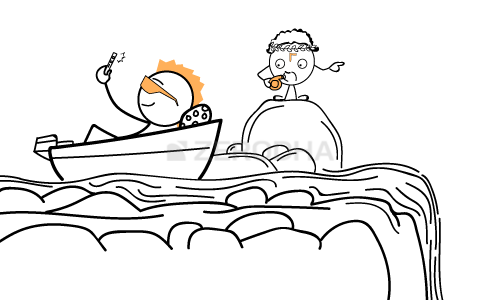 Now, here is trick question for you – In the earlier chapters, we had discussed that the Delta of the Futures contract in always 1, so what do you think the gamma of the Futures contract is? Please leave your answers in the comment box below :). I know there are many traders who define their risk limits while trading. Here is what I mean by a risk limit – for example the trader may have a capital of Rs.300,000/- in his trading account. Margin required for each Nifty Futures is approximately Rs.16,500/-. Do note you can use Zerodha’s SPAN calculator to figure out the margin required for any F&O contract. So considering the margin and the M2M margin required, the trader may decide at any point he may not want to exceed holding more than 5 Nifty Futures contracts, thus defining his risk limits, this seems fair enough and works really well while trading futures. But does the same logic work while trading options? Let’s figure out if it is the right way to think about risk while trading options. The trader is short 10 lots of Nifty 8400 Call Option; this means the trader is within his risk boundary. Recall the discussion we had in the Delta chapter about adding up the delta. We can essentially add up the deltas to get the overall delta of the position. Also each delta of 1 represents 1 lot of the underlying. So we will keep this in perspective and we can figure out the overall position’s delta. So from the overall delta perspective the trader is within his risk boundary of trading not more than 5 Futures lots. Also, do note since the trader is short options, he is essentially short gamma. The position’s delta of 5 indicates that the trader’s position will move 5 points for every 1 point movement in the underlying. Do you see the problem here? Although the trader has defined his risk limit of 5 lots, thanks to a high Gamma value, he has overshot his risk limit and now holds positions equivalent to 8.5 lots, way beyond his perceived risk limit. An inexperienced trader can be caught unaware of this and still be under the impression that he is well under his risk radar. But in reality his risk exposure is getting higher. Now since the delta is 8.5, his overall position is expected to move 8.5 points for every 1 point change in the underlying. For a moment assume the trader is long on the call option instead of being short – obviously he would enjoy the situation here as the market is moving in his favor. Besides the favorable movement in the market, his positions is getting ‘Longer’ since the ‘long gamma’ tends to add up the deltas, and therefore the delta tends to get bigger, which means the rate of change on premium with respect to change in underlying is faster. Suggest you read that again in small bits if you found it confusing. But since the trader is short, he is essentially short gamma…this means when the position moves against him (as in the market moves up while he is short) the deltas add up (thanks to gamma) and therefore at every stage of market increase, the delta and gamma gang up against the short option trader, making his position riskier way beyond what the plain eyes can see. Perhaps this is the reason why they say – shorting options carry huge amount of risk. In fact you can be more precise and say “shorting options carries the risk of being short gamma”. Note – By no means I’m suggesting that you should not short options. In fact a successful trader employs both short and long positions as the situation demands. I’m only suggesting that when you short options you need to be aware of the Greeks and what they can do to your positions. Also, I’d strongly suggest you avoid shorting option contracts which has a large Gamma. This leads us to another interesting topic – what is considered as ‘large gamma’. Earlier in the chapter we briefly discussed that the Gamma changes with respect to change in the underlying. This change in Gamma is captured by the 3rd order derivative called ‘Speed’. I won’t get into discussing ‘Speed’ for reasons stated earlier. However we need to know the behavior of Gamma movement so that we can avoid initiating trades with high Gamma. Of course there are other advantages of knowing the behavior of Gamma, we will talk about this at a later stage in this module. But for now we will look into how the Gamma behaves with respect to changes in the underlying. The chart above has 3 different CE strike prices – 80, 100, and 120 and their respective Gamma movement. For example the blue line represents the Gamma of the 80 CE strike price. I would suggest you look at each graph individually to avoid confusion. In fact for sake of simplicity I will only talk about the 80 CE strike option, represented by the blue line. Strike values below 80 (65, 70, 75 etc) are ITM and values above 80 (85, 90, 95 etx) are OTM options. Notice the gamma value is low for OTM Options (80 and above). This explains why the premium for OTM options don’t change much in terms of absolute point terms, however in % terms the change is higher. For example – the premium of an OTM option can change from Rs.2 to Rs.2.5, while absolute change in is just 50 paisa, the % change is 25%. The gamma value is also low for ITM options (80 and below). Hence for a certain change in the underlying, the rate of change of delta for an ITM option is much lesser compared to ATM option. However do remember the ITM option inherently has a high delta. So while ITM delta reacts slowly to the change in underlying (due to low gamma) the change in premium is high (due to high base value of delta). One of the keys to successful options trading is to understand how the individual option Greeks behave under various circumstances. Now besides understanding the individual Greek behavior, one also needs to understand how these individual option Greeks react with each other. So far we have considered only the premium change with respect to the changes in the spot price. We have not yet discussed time and volatility. Think about the markets and the real time changes that happen. Everything changes – time, volatility, and the underlying price. So an option trader should be in a position to understand these changes and its overall impact on the option premium. You will fully appreciate this only when you understand the cross interactions of the option Greeks. Typical Greek cross interactions would be – gamma versus time, gamma versus volatility, volatility vs time, time vs delta etc. For the given market circumstances which is the best strike to trade? What is your expectation of the premium of that particular strike – would it increase or decrease? Hence would you be a buyer or a seller in that option? If you plan to buy an option – is there a realistic chance for the premium to increase? If you plan to short an option – is it really safe to do so? Are you able to see risk beyond what the naked eyes can spot? The answers to all these questions will evolve once you fully understand individual Greeks and their cross interactions. So as you see, we have miles to walk before we sleep 🙂 . Special thanks to our good friend Prakash Lekkala for providing the Greek graphs in this and other chapters. hi, went through the chapter and found the presentation a little harried than the others. calculations were off the mark and in places no decimal points are incorporated. karthik, were you not involved in this chapter? Raj, thanks for your feedback…can you please point out the errors, will make the necessary changes? so what do you think the gamma of the Futures contract is? 😮 ans it pls. The gamma of the future contract will be Zero. Thank you for helping us. Sir my concern is with the Delta vs. Spot curve for put option. As spot value increases the delta also increase. Kindly pardon me if I have misunderstood something. Please help me in this. Shakti, thats right. As the underlying decreases, the PE option delta gains in value and as the underlying increases, the PE option delta loses in value. Thank you sir, just got it. Here negative sign just shows that the if one gains other loses value. It is really commendable work that you are doing. My doubt is how is the gamma value arrived at? Gamma value (in fact delta, theta, and vega) values are all calculated using a mathematical model called “Black & Scholes Options Pricing Model”. We will briefly talk about this in the coming chapters. Very very thanks for this chapter. Although chapter has some minute printing mistakes of decimals and some calculation mistake(which doesn’t matters at all) but it is a very good and clear chapter which boosts my concept about gamma. If one square off his position at current price, will his position be square off because deep itm options have very less volume. Is any volume issue occurs??? You can square off the position anytime you want…as long as there are volumes (counter party). I can appreciate complex mathematics Karthik – Would you suggest any book in particular (preferably by an Indian author who has kept indian indicies and stocks in perspective) for options? I am suddenly getting very interested and I will like to utilize the interval between which the chapters are posted here. 1. Does it make sense to trade naked call/put options with say 1 lot nifty or is it just a bad idea altogether? 2. In your practical experience, are there folks who only trade options and nothing else? 3. In your practical experience, is it very difficult to make money with options? Also, what is better? Trading intraday or with 1/2/3 months time frame? Saurabh – Options trading is a different animal altogether. One needs to be aware of many different aspects involved. I’m really not sure which book to recommend, I found some of the books that I’ve read previously quite shallow. Maybe I’ve not updated my library so may not be the best person to answer this for you. 1) No harm trading 1 or 2 lots of naked options – lot size is not much so you don’t risk anything significant. But neither will this create any significant wealth for you. In fact I do this quite often just to test few random ideas. 3) You certainly can make money trading options – but you need to set your expectations right (ref section 1.3 – http://zerodha.com/varsity/chapter/background/). Trust me if you can consistently make 2% a month trading options you are doing a phenomenal job. Unfortunately most people perceive this a small return and aim for a higher return, in the process blowing up their account. So my take on this – aim for small but CONSISTENT return. Also, I prefer to trade with slightly longer duration than intraday. I avoid intraday because I don’t find the time and commitment it requires. Thanks for the inputs Karthik. Does zerodha provide a virtual trading a/c? It would be of great help if there is. I tried the one on NSE (Pathshala) but don’t get how it is showing my MTM as +ve when I in fact know that it is in the red. A simulated environment would really help! Saurabh, we do not have a virtual trading platform as of now. But that is certain something we plan to do in the future. sir what is naked options? When you buy an option without any hedge, then its referred to as a naked option. All single option positions are naked. For ex : buying a call, buying a put, shorting call etc. Thanks for the excellent work that you are doing Karthik Sir. How many chapters have you planned for Options Module? Not sure how many chapters but there are at least 5-6 major topics that needs to be covered. This may happen over the the next 3-4 chapters (or more). Sir, why u removed quantitative concepts module? We have it Keshav. Its just that we decided to include the taxation module we have removed that for time being. Will certainly have a module on that topic. i like your new pic. waiting for chapters on vega and theta. when will you upload??? Working on the Theta chapter…should be up by next week! Thanks for easy explanation on gamma. You had asked about gamma for the future contract. It is having fixed delta, 1 so no change in the delta means gamma of future contract will be zero. Please correct me if I am wrong. Why Gamma of future contract would be 0? You do have a point, Amit. I’ll get back to you on this. The change in delta is 0 (gamma). Therefore new delta = old delta + (gamma *delta). Gamma of Futures will be ZERO due to nil change in value of DELTA which is 1. Karthik – I have heard a lot about this open source software ‘Options Oracle’ by Samoasky technologies. What is it used for and how is it beneficial? I’ve personally used Options Oracle extensively, I must admit the software was one of its kind. I guess they stopped supporting Indian markets and hence I lost interest..or something else happend which stopped me from using OO. Cant recollect the exact reason. I will include all these topics in the coming chapters, except for Max Pain…which will be included in the next module. Does PI support all the above mentioned features? No, it does not for the moment. However we will probably have a tool to evaluate these parameters sometime soon. can we find these in kite mobile app also? First of all; excellent ,excellent work…..I have read a lot of material (books, websites, platforms, trading mentors etc etc) but none of them have been as concise and simple as your content is. You can really “Teach” ..hats off. …. 1) If i am a regular nifty futures trader, trading say 10 lots on a regular basis, i can instead trade 20 lots of nifty ATM options (only buy CE/PE) for the same effect (positive or negative return) …..If my trade is in my favor and delta keeps on increasing, i need not adjust my position since the increased delta is improving my return……However, if it is going against me , i may need to adjust (reduce) my position based on the delta of the CE/PE i am holding???? If i am only buying ATM options, position going against me may also mean that delta is reducing ? and therefore my risk may also be coming down? It is more a question of the rate of change…..i.e the reduced position delta is within my initial risk range or not??? If you buy an ATM option and the position starts to move in your favor the both Gamma and Delta works in your favor as the option transitions from ATM to ITM. However if you short options (ATM in this case) then more than the Delta you need to be worried about Gamma as you are essentially short Gamma when you short options …and ATM options have the highest Gamma value so you are taking on a large risk. This also means you need to constantly tweak your position to ensure you are always short ATM option and not really ITM or OTM. This incurs logistical expenses…for that sense its better to just trade futures. However there are many trading secretaries (like Dynamic Delta hedging) which requires you to substitute options for futures. We will talk about it more in the subsequent modules. In the example you have quoted you are comparing long futures 10 lots @ 8471 with 20 lots of ATM options ATM strike. ATM has a delta of 0.5. So if the market moves from 8471 to 8430, then it falls by 41 points. Hence Long futures 10 lots = Long ATM calls 20 lots. So as you can see once the option moves away from ATM status, it no longer becomes a surrogates for the futures contract. In order to maintain the equivalence you always need to adjust the option to ensure you are dealing with ATM options. 2.Values below 80 is OTM and values above 80 is ITM. Sir This is confusing. When ATM is 80 the >80 is OTM and <80 is ITM. Is my statement is Ok? Oops, thats a mistake. Since its a call option, it should read “Values below 80 as ITM and values above 80 are OTM”. Thanks for pointing this out, will make the corrections. What earlier printed was correct right. Because it is call (80CE) and hence Spot price below 80 the call becomes OTM and spot price above 80 makes call to be ITM. Assuming the spot is at 80, strikes such as 60, 70, 75 etc are all ITM, and above 80 such as 85,90,100 are all OTM. Sir we have range for delta +0 to 1 & -0 to -1. Similarly what is the range for Gamma so that we can judge high & low. Its difficult to estimate the range for Gamma…from my experience a Gamma of 0.005 is considered quite high. Is it possible to define gamma w.r.t. delta in place of underlying price as the second derivative may define based on the first derivative also apart from the base variable. Like distance, change in distance is velocity and change in velocity is acceleration. This may bring the delta calculation direct. My second question is that why we have to worry more about gamma when options are at ATM or otherwise as gamma is constant for practical purpose………………..Why short position are more affected by gamma? Yes, you can treat Gamma as the 1st derivative as Delta, no harm with that. When the option hits ATM status, then Gamma hits maximum value. See the graph posted in the chapter. Also since Gamma is always a positive number, shorting options carry the risk of “Short Gamma’. Hence I say short positions carry ‘short gamma’ risk. However this should discourage you for shorting options, juts bear in mind the fact that when you short Options, you are short gamma. Good work Karthik. Really liked the way the concepts has been put across in a very simple language. Is it possible to provide a module to explain starting from TA on an underlying to identify the direction of the underlying and thereby identifying a strike price using greeks. Great idea Amit, thanks. Towards the end of this module I will include a case study based on your suggestion. In extension of Amit post: Actually the spot movement depends on many factor like TA, fundamentals and current news, global developments etc. This is a normal concept. I want to know is it possible that TA will be always dominating other factors? How to judge the more effective factors. At times we have seen that even after the quarterly results are good the script price goes down and vice versa. Is it that there TA was having more power? Examples are SBI, Infy, Kotak B etc. You always need to take a holistic view. There are many factors that affect the stock price form a short term perspective, although only business fundamentals matter in the long run. As a trader you need to develop a sense for all these factors and never isolate a certain factor as more dominant. How to judge these factors and assign a weight to the price movement is something you will develop as you spend more time in markets. But options and future are valid for 1 month only or future may be for few months which I thinks is shot term and we have to analyse the market like a short term trader. Hence for Options all factors will matter. How to slowly rope in all factors may be of option’s trading. This was my point. Understood your point, one of the readers (I guess Amit) suggested that I do a case study where I consider all points and factors and plug things together. I think thats a great idea I will do it towards the end of this module. That should answer most of your concerns. When would you upload option strategies module? ?….I am eagerly waiting for the same….. The current focus is to finish Option Theory…few more chapters here…once we are done with Options Theory, we will start work on Options Strategies. I guess sometime next month we should get started on Options Strategies. Thanks for your kind words Abhijit. It is indeed both encouraging and motivating for us. Please stay tuned for more. When would you upload Option Strategies Module?? I am eagerly waiting for the same…. The gama decreases when a call option transits from ATM to OTM and ATM to ITM. due to the lower gama the change in premium is minimal with respect to the change in underlying. since, the ITM call options have a higher delta the change in premium in points term is higher even though the gama plays the drag. would this be a correct assessment karthik? You said “The gama decreases when a call option transits from ATM to OTM and ATM to ITM. due to the lower gama the change in premium is minimal with respect to the change in underlying” —-> This is correct, however do remember in terms of absolute points change it maybe minimum but % wise, it will be a reasonable number. “since, the ITM call options have a higher delta the change in premium in points term is higher even though the gama plays the drag” —–> Right on. However Delta is highest when Options are near ITM…but at ITM gamma is lower. ATM delta is around 0.5, but the sensitivity at this point is high as the gamma is the highest at ATM. There is a mistake from you in chapter number 13.3. You wrote that when the spot price is below 80, the call option with strike 80 is in the money and above 80 is out of the money. It should be other way around. Spot above 80 should be in the money while below 80 should be out of the money. Not a mistake Amarjeet, it is correct. We are talking about a call option here. So strike is 80, spot is 80…so 80 is ATM, all strikes below 80 (like 70,75) are all ITM and above 80 (85, 90) are all OTM. Awesome is the word for your efforts, knowledge and presentation skills Karthik, I am trading (or I must say gambling 🙂 ) options since 2007 with absolutely no knowledge of all these factors and now I know why am I in huge loss :). I am still unable to grasp all of it but this is the best thing so far and my dream of becoming full time trader now has a new hope !!! Question :- When does the delta change for given option? for example if spot is at 8000 and 8050 ce is OTM with delat say 0.3 and spot moves 100 points to 8100 in 4 hours making 8050 ITM at what point will delta change? is it time dependent i.e end of market or start of market or is it price dependent i.e every 20 points etc? Thanks for the kind words and appriciation 🙂 I hope you find all the success in trading and everything else. About your query – Delta (and other greeks) changes real time as and when the markets move. but when i check that same option at that same strike price and same expiry i get completely different numbers in the option chain for Bajaj Auto. These numbers are different every day across moneycontrol and NSE option chain . Mehul – I’m not sure why this happens, I would suggest you stick to NSE website, they provide the most reliable market information. OTM(80 and ABOVE) for point 5? or am i really confused? Hey, thanks for pointing this out. I had kind of messed up this narration. Have fixed it now, please do have a look to check if it makes sense. Yes, what you said is true – we have less time for expiry in July series where as the August series has more time to expiry. Strike selection is an important topic, will certainly talk about this. The gamma for Futures (also other cash products) where delta is 1 meaning the rate of change in price is in perfect correlation to the change in Price of the underlying, would be Flat, since there is no curvature on the Delta curve during the life of the product. As we know from elementary mathematics that ‘derivative’ of a constant (i.e. delta = 1) is 0. (b) OTM options are great candidates for short trades assuming you intend to hold these short trades upto expiry wherein you expect the option to expire worthless. I couldn’t understand the basis of these statement. Would be grateful if you could explain it. Both the statements hinges on the same fact – towards the expiry OTM and ITM options have a great chance to remain OTM or ITM, hence they can expire worthless….therefore they are great candidates for shorting. Whereas ATM could be a bit tricky…it has a 50 – 50 percent chance of expiring as a worthy contract/not worthy contract…hence no point taking the risk to short these options. Thank you for your explanation. Now I feel how silly my doubt was. ??? After getting inspired I am planing to write Call options that are slightly OTM. Could you please tell when exactly an option is considered to be ATM. Is it when strike Price falls within some price band around spot price say when Strike Price = Spot Price ± some %age of Spot price ? What is that %age ? What ideally should be delta, gamma and theta values to write OTM call options ? ATM is when the strike price equals (or approximately equals) spot price. Also please dont write options early in the series, wait for few…its best to write options after 15th of …also please avoid writing ATM options. I am really thankful to you for providing so many insightful articles. Its very easy to read and best part is its applicability in the real scenario. You are amazing. I have one query. In 13.2 example … since we are short on 10 lots Nifty 8500CE so Delta would be -ve as i have done below. Please clarify. 1) first we consider 70 points upwards , premium appreciates . instead of considering a 50 point downward movement . let us consider a 70 point drop . in this case the underlying is back to original state with no profit & no loss . but when we calculate new premium , it is a t a loss and depreciates to 36.85 ….. am i correct or have i made a mistake ? but in this case also , the premium is at a loss at the value = 34.75 . PLEASE DO CORRECT ME IF I AM WRONG . in this kind of scenario , why & when should anyone consider option trading other than spot or future markets ? Since the derivative of a constant is zero . Also i wanted to know that does gamma have a range like that of delta ? Not really, Gamma peaks for ATM options and cools off for ITM/OTM options. Hence the gamma graph looks like an inverted parabola. A option is either ITM, ATM, or OTM and it remains the same for both option buyer and seller. In the example you have quoted the option will be an ITM option for both buyer and seller. This is in response to your trick question on GAMMA. I feel GAMMA does not apply to futures as the DELTA is constant ie 1 for FUTURES. Please let me know wether I am right or wrong. several time i see in some website “don’t short put option (normally)” , can you please explain…. Yes, simple reason being that the panic spreads faster than greed, in other words its much faster for the market to fall 100 points than go up 100 points. Hence shorting options can be a bit scary. Yes Gamma is the 1st order derivative…in fact you can differentiate this further to get the 2nd order derivative :). 2nd order is used to hedge posistions especially when you are running a huge trading book. For small retail positions this is not really required. Above you mentioned ” Notice the gamma value is low for OTM Options (80 and above). This explains why the premium for OTM options don’t change much in terms of absolute point terms, however in % terms the change is higher.”, I get that premium doesn’t change much in terms of absolute points because of low delta but how does low gamma affect relative change in premium? Well, if the gamma is low, then the premiums don’t change much. However if the volatility increases drastically or if the market moves in favor then option premiums for low gamma options tend to move…this is when you will see OTM options doubling in value. Recent example was the way L&T options reacted to a 14% increase in the stock price. Your every response to public doubts and the articles encourage people to trade before they opt out due to risk taking in markets. 1. In your 1st two example showing a change in the delta with respect to Gamma with 70 points up (in each) changes the moneyness from OTM to ATM and lastly to ITM giving a premium of 80.25 keeping the New Delta at 0.65. My question if Nifty changes by 140 points up directly (irrespective of 70, 70) although the moneyness becomes ITM from OTM. But giving a premium of 68 at Delta 0.65. How to get a proper view on this ? 2. Every Underlying or Index has it’s lot size stated on NSE website. Can we choose lots below the stated. Say Nifty has 75 market lot, can we take 20 lots for trade or we have to trade on 75. No, you cannot change the lot size, you will have to go with what the exchange prescribes! Sorry Karthik, if I have confused you with my confusion. My question was not about the directional view rather it was on the premium change that took place from OTM to ITM in your example. Here in the above two example 8400 Call option has moved from Slightly OTM to ATM and then to ITM giving a total premium of 80.25. Why there is a big difference in the case of premium when the OTM transits to ITM in both cases? So my question is how to rectify such confusion, not directional view? 1) Mathematical explanation – Technically speaking the change in premium, delta, and gamma are all defined for 1 point change in the spot price. So when I say there is a 70 point change in spot, I tend to directly multiply the 70 points change with delta (or gamma) to get the premium value..but note this is just an approximation. To get the true value for a 70 point change in spot, I will have to calculate the change in premium by changing the value of delta (and gamma), for 1 point at a time….and I will have to iterate this 70 times. This is when when i get true value of the premium. In fact gamma/delta are instantaneous values and I will have to do this one step at a time. An alternate way to do this is would be by integrating (recall your school calculus) over the change in premium. Calculus? You are kidding right! So if I want to square off my position at 12 pm what will be the consequence according to the above follow up? Calculus plays an important role in derivatives! Either ways, the same explanation that I gave above holds true. Also remember when such a rapid move happens on a intra day basis the effect on premiums will be much higher. It means if price movement rests its value changes but during the movement, no value get affected? And if the movement lasts for less time the change in premium is high? Am I wrong somewhere? Sorry Nil, I’m bit lost on what you just said – can you please break this down for me? Thanks. 1. When spot price starts to change, the other values of an option get affected once the spot price reached a higher/lower value than earlier. Summary: Spot price 8326 changes 70 points twice within less time than the change of 140 points. Hope you have understand my confusion. Big movements in higher time, Less premium”. Thank you, Karthik. Your quick response makes me more enthusiastic to tackle further. Hope you won’t mind if I come back to you again. Please do fee free to post as many queries as you want, it will only enrich the forum! Problem is : There is a difference in premium when calculating of movement of 70pt + 70pt & in single stroke 140pt. we will get the correct Premium… right? Yes, the continuous calculation is the best approximation to the actual value. How do we calculate Gamma and Delta in first place?? Its derived from the B&S model. Sir since ITM is similar to future contracts, is it wise to trade them like futures using technical analysis with a lower margin ? They behave similarly but they are not the same 🙂 …having said that, yes you can attempt to do that for deep ITM options. In “Case 1 – Underlying moves up by 10 points”, the new delta should be -0.5 – 0.04 = -0.54 as delta is loses its value when the underlying price goes up so its value must decrease. 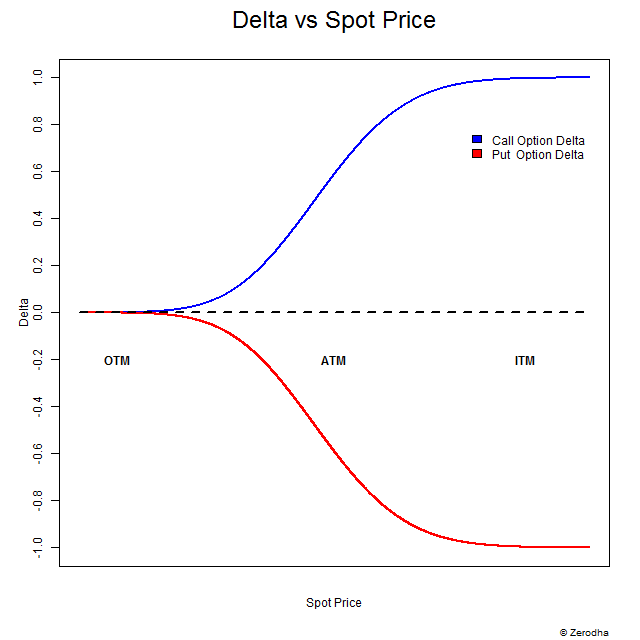 It is also clear from graph of delta vs spot price for put options that value will decrease. Similarly in case 2 answer should be -0.46. Delta of a Put option decreased when the underlying increase, hence-0.5+0.04 = -0.46 is correct. Remember, for Put option, delta is negative to capture the effect of decrease in delta for increase in underlying. Right now I am holding 12900 qty of option 9500CE at the average price of rs.3.00. But currently the price is rs.1.15. Can you suggest what can I do now.can I hold it or sell it. Another 7 trading days only available for match. The loss is 23 k now. Vijay, this really depends on your conviction. If you feel the markets can make a move higher then 9500, then please do hold, else sell it and book your loss. He is short call and the assumption is that Nifty moves higher by 70 points, so the option becomes ITM. New Delta = We know the Put option loses delta when underlying increases, hence – 0.5 + 0.04 = – 0.46. I think here delta= -0.5-0.04=-0.54. Yes, Puts lose delta when market moves up. New Delta = We know the Put option gains delta when underlying goes down, hence – 0.5 + (-0.04) = – 0.54. Makes sense, I guess someone earlier had posted a reply as well. Request you to double check. Thanks. The Gamma of a futures contract would be 0 right? Yup…this also explains why the delta of a futures is a constant 1. In the example of calculating risk using Gamma, shouldn’t we consider negative sign before the number of lots because we have taken a short position? i.e. position delta = -10 * 0.5 = -5.
then, when the market moves against me, new gamma = 0.05*70 = 3.5.
therefore, shouldn’t the new delta be = -5+3.5 = -2.5? Please correct me wherever I’m wrong. No gamma is a positive number…and remember, we are only trying to estimate the risk in terms of number of lots here. how the delta and gamma are calculated ? Black & Scholes model helps you calculate these values. Does premium also comes to zero on the day of expiry? No, the value of the premium will depend on the intrinsic value of the option. “suppose i am very bearish on a particular contract and i decides to buy a way far out of money put with next month expiry (since i am extremely bearish on it) which is available at almost free of cost lets say may be around Rs. 0.80 – 1. so before initiating the trade should i look for delta & gamma, when there is nothing on stake. No, if you are convinced about your view, you can do this….i.e buy way OTM option with ample time to expiry. As we have seen position of ATM options is most sensitive to changes in underlying therefore the effects of gamma on it but why is Gamma of an ATM option highest? Think of gamma as a representation of the sensitivity of an option to the underlying’s price movement. ATMs clearly are the most sensitive. Given this, the gamma is highest for ATMs. About Theta – not true. All options lose money with respect to time. 1. I don’t think I have understood the difference between short gamma and long gamma. Is it that if you have taken a long position, it is long gamma and if you have taken a short position, it is short gamma ? 2. Let us say that an option is ATM, where the gamma is the highest. Now whether the price moves up or down, the gamma is going to decrease in the same way (because the gamma curve is like a bell curve – I have assumed it to be symmetrical about the ATM). With this, if I have shorted the option, the risk of price going up is the same as the reward of price going down, isn’t it ? So why is it dangerous to short an ATM option, considering that the reward is equally good ? One reason I can think of is that as the price increases, the Delta also increases and hence it has a cascading effect (thus increasing my losses, if I have shorted) whereas when the price falls, Delta decreases so as to minimise the overall effect a bit, thus reducing my profits a bit. In other words, the losses I incur by a move of x points upwards in the spot price will be more than the profits I make by a move of x points downward. Is it ? Welcome to the family, Chengappa! 2) Since ATM options have the highest gamma they also tend to be the most sensitive options. It’s like this – assume you are short simultaneously on an ATM option and also short on an OTM option. Now if the market moves against you, then obviously you will lose money on both these short positions…but you will lose much more on the short ATM position compared to the OTM option. I understand that the unfavourable market movement affects the ATM options more than OTM options because of high gamma of ATM. For example, if I have bought an OTM call and an ATM call, if the price comes down, the drop in premium is more for the ATM call, right ? 1) Depends on your trade set up and the targets you have set. Also, if you are holding an option which has transitioned from OTM to ATM, then you will have enough cushion in terms of profits. Take the 91-day t-bill as a reference rate. Thank you karthik sir.. indebted for your guidance on truly each and everything! ? Sir you are too good! Thanks a ton! Pretty sure your first diagram delta vs stock price is wrong for the put delta. Put delta doesnt start at 0 and move to -1 it starts at -1 and moves to 0. The two curves should be shifts of each other not mirror images. Not really. Read this chart starting from the ATM position. First of all, thank you very much for putting up varsity. I learned a little bit of FA and TA through some classes. Futures and options classes are priced too costly and was searching for alternatives. That is when I landed here. When I finished all your options module, to my surprise, I noticed that I did not even take a single line of notes for the first time in learning anything in my life. All just went, straight into the head ;). Such was the manner how the concepts are explained. Referred many of my friends to this site. I will be doing my first options trade next week :). So I am doing a quick recap of all the modules. While doing so, I also noticed that there is a slight confusion in the delta vs spot price figure. May be you need to remove the spot price caption at the bottom. Going by delta vs spot price in the figure, it conveys that as the spot price increases delta of the put option goes from 0 to -1. I think this is what Fbish pointed out. In such case for put option, the call option delta curve would just shift down. If we want to go by OTM, ATM and ITM labels, then we may need to remove spot price caption below. It may lead one to interpret that spot price increases from left to right. Thanks again Karthik Rangappa and Team Zerodha. All your sincere efforts are highly appreciated, deeply regarded and will be remembered through out my journey in the markets. Vetriselvan, thank you so much for such kind words. I’m really happy you liked the content here. Quite a few people have pointed this on the spot vs Delta chart. The trick is to start from the center of the graph and then look to the right (where the spot increases) and then to the left (where the spot decreases)…and observe the behavior of both Call and Put Delta. Anyway, I will see what I can do to make it easier. Anyway, good luck for your very first options trade. Hope you learn and earn well! Thanks for the reply and your wishes :). Starting from the center makes it easier. You may consider putting separate labels for put and calls along the curves. Starting from the left for calls, it would be OTM, ATM and ITM and for puts it would be ITM, ATM and OTM with blue and red colors. Alternatively, you may just remove the labels and draw arrows from the centers towards the left and right saying decrease and increase in price respectively. Thank you.Your material is simple to understand. Initially, you are assigning values for delta as 0.2, 0.8 etc.. for Delta 0.05, 0.025 etc..
How can we fix those values? Are those are estimated values? Rajesh – I’m unable to understand this bit – “assigning values for delta as 0.2, 0.8 etc.. for Delta 0.05, 0.025 etc..”, can you please rephrase this? Gamma for the future contract would be zero as delta for future is constant. Yes, the delta of Futures is 1. Here we are calculating delta change considering 70 points change in spot price. Now I am sure in real world delta calculation happens for every single point change in spot price so for every point change in spot we use to get new delta as per calculation explained above. Am i right? The delta calculation explained here is only an approximation. Remember, when we say 70 point change, we are talking about ‘direct’ change of 70 points. In reality, it does not work that way. Good luck and happy learning, Azeem! I had a concern though, the statement ‘when you short options, you are shorting gamma’ is still unclear. If you could further delve into this aspect and enlighten us. Thank you for the amazing write-up. This is quite straightforward, Ashish. Gamma is always a positive number – and not like the DELTA which can take -ve value based on the position you take. So when you go long on an option, you are also long on the gamma, likewise, when you are short on an option, you are also short gamma. Delta is additive i.e. we can add delta, what about Gamma and other greeks ? If they are also then please give example also. You cannot really add the other greeks like Delta. Sorry for troubling you with many questions. I am new to options in fact to the market. I dont get it when you say long gamma and short gamma. I understood, ATM options have high gamma as the delta is in take off and acceleration phase. “In fact you can be more precise and say “shorting options carries the risk of being short gamma”. What does this statement mean actually sir?? Thank you so much for responding all queries. Gamma, unlike delta, is only positive for both long and short options. The gamma dictates the rate at which the delta moves. If you are short on an option, then essentially you are also short on Gamma. Like in any position, if the position starts moving against you, you have the risk of a loss. Its just that short option position carries significantly larger risk compared to long options. I’ve only tried to express this risk in terms of the Gamma. From the last graph of gamma vs spot price, can we say as strike price increases (for any option call or put, buy or sell) the maximum gamma value decreases? Yes, this increase has to happen with respect to time and speed of the market. Hello karthik, In one of the examples above options = 8400CE And position = short . But we buy a call option when we expect the price to go up, so shouldn’t the position be long ? If you are short on the call option, then you essentially expect the prices to go down. Likewise, long put. If you are short on the Put option, then you expect the price to go higher, likewise, long call. So does this mean that now he is going to suffer a loss or his profit is going to decrease as the price is going to decrease ? Hello sir, according to the first graph when the spot price increases the delta for put option becomes more negative but in case I (one) of the example as the price moves up by 10 points The Delta becomes less negative ? BTW thank you so much sir for sharing your wisdom with us ? This depends on which option and which position you are looking at. As the price moves higher, long call and short Put gains more delta. If the price drops, short call and long PUT gains delta. the gamma of the futures contract is zero. Yup, and hence the delta is fixed to 1. I had a question regarding the movement in the premium wrt delta, as you said gamma is acceleration so shouldn’t the delta change at every tick in the underlying. Which would form an arithmetic progression with gamma as the common difference. In fact, this is how it works, Animesh. It is on a continuous basis. For sake of simplicity and ease of explaining, I had to take a step approach where I’ve assumed the price moves in steps. Hey thanks a lot for clarifying . Hi karthick, I want to learn about stress testing and backtesting. Can you please help me into this? Check out https://www.streak.tech/ for backtesting, Santosh. Thank you and what about Stress Testing…? Stress testing is a bit complex, involves multiple scenario generations. I’m not sure of any platforms which can do this. Gamma can hit close to zero on the lower end, but there is no upper cap (theoretically). But for ITM gamma becomes saturated..so if there is no upper cap then it should not become saturated..please correct me if m wrong!! In fact, Gamma has a bell shape curve. At its peak, it starts to decline. I;m not sure, Pradeep. Have you checked out Sensibull? Yes, the rate of change of Delta is captured by Gamma. derivative of a constant is zero so futures with delta “1” will have gamma value “0”. Futures have a delta of 1 and therefore a gamma of 0. Really an awesome experience learning this! If only other academia had such clarity!! Souvik, I’m really glad you liked the content here. Happy learning! I don’t know how to thank you for pulling me towards stock market trading! Every chapter loads my brain with lot of new content. It is so refreshing to learn lot of new things. Keep up the good work. It might be exaggerating to say, but it is truth, there are hardly better teachers than you in the real world. You are awesome! Content is awesome in every sense! And kudos to you for replying to every comment with such love! Sir please write a complete chapter on hedging using put option. Lot of doubts on it. Can I buy 2 put options or complete lot of 75 fir nifty. Gamma for Future is 0 as Delta for future is 1 every time. Since it’s constant, it there is no change in delta. Hence, since gamma value changes delta value when price of underlying is changing, gamma is 0. Mathematicaly, derivative of a constant function is zero. My question is then if delta for future is 1 why don’t equal number of points go up or down on a future of a stock and it’s spot? Also on practical examples, since the above is true, gamma won’t be zero since delta is not constant always. That’s right, the gamma of Futures is 0. Btw, Futures and spot move in tandem. Hi, Varsity is just amazing guys! Keep up the good work! I have a question in this chapter. I understand that the risk position changed from 5 to 8.5 in the above example when a trader is shorting his position on call options. However if a trader has a long position on call options, then to my knowledge whatever be the change in the gamma, the risk remains to the extent of the premium paid right? So basically a change in Gamma against my long call position will not make much difference as the risk is only and only the premium amount and nothing more than that. Is this understanding correct? Yes, when you are long, the gamma risk is contained. In fact, when you are short, the gamma risk is the highest. Need to look into that, Mayank. Thanks. My question is THAT you said going short on ATM is risky as slight increase in the underlyimg changes the delta by greater margin(which is not possible in deep ITM and deep OTM). BUT same thing is applicable for going long also,If underlying prices fall. Then going long is as as risky as going short. Then why you warn in going short if both are equally risk…..Or is it just because we already presume market to be bullish? successful trader employs both short and long positions as the situation demands. And sir your varsity project is really good and upto the mark.And i really wonder that its free..Although i have acxount on zerodha but still you are doing a great job sir. When you short options, you are also short on Gamma, which is the rate at which the delta changes. When the position goes against you, the gamma too goes against you. This does not happen when you go long, Edward. For this reason, the risk of writing options is higher. Gamma for futures contract will be zero as there is no change in Delta, and when delta is constant then there in no question of Gamma Having non zero value. I have been wanting to write you for quite some time so here I go today. Many thanks for writing these lessons/chapters. They are all awesome. Since I wanted to understand options, I straightaway went to options. They are all written so well and with such depth that I haven’t seen in many study materials those are on net. Thanks a lot for taking pains to write each and every module, chapter, and so on. I really appreciate it. Thanks to Zerodha too for making it available on-line absolutely free of cost! Gratitude folks!! Now the question- I could not understand why different gammas has different values at peaks (i.e. at ATM) for different strikes? I could not find this question in the long list of questions asked before? And How are these values derived? meaning what makes 80 CE ITM Gamma value 0.004 and 120 CE ITM Gamma at 0.003 (referring to gamma vs spot graph featured above) ? Do I get an email notification when my question is answered? would appreciate one. Thank you in anticipation Karthik. Thanks for the super kind words, Abhijit. These are three different strikes, hence the gamma value changes. But the point to note is that the gamma peeks when the strike reaches the ITM status and this is true for all options (call or put) and across all strikes. Would the Gamma be “0” for a Future Contract? Basically!!!!! Where can we find the delta and gamma values for the options. Any option calculator will give you this information. Sir varsity app is good I liked the related links,expert opinion and quiz part even I took the certification of technical analysis and completed it successfully on 1st attempt with 220points.But disappointed that there is no comments section here I learnt most things through comments section in varsity web please include comments section here also. Including the comments can be a huge task. But will bounce off the idea with the team. Sir Gamma and theta are always positive numbers for both calls and puts but why here they are negative and what is values of Greeks indicating here. These are just reporting conventions, Srinath. Negative theta indicates the number of points it decays by each passing day, since its technically a loss, its shown in -ve. Gamma is -ve for put when the spot moves up. Hence -ve. Sir here ur saying Gamma is -ve for puts when the spot moves up but in this module u have stated unlike delta Gamma is positive for both call and put. You can consider it as positive and it gets deducted (for PUT option) when mkts go up.